Pizza is an easy dinner and both a great way to use up those leftover tidbits in the fridge and get kids in the kitchen. We have make-your-own-pizza night nearly once a week, a favorite night for our 6-year-old as she loves "building her own pie." 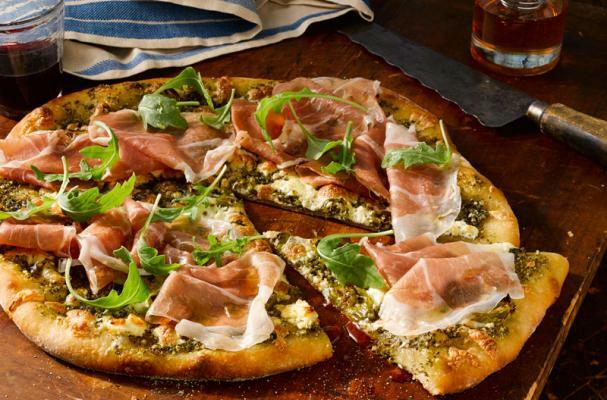 Fresh arugula and Prosciutto di Parma are always two must-have ingredients for me and this pizza recipe includes both, plus a little more - a flavorful arugula walnut pesto. There's no tomato base on this pizza, just the pesto, mozzarella and a bit of plain goat cheese. Once out of the oven it's topped with deliciously salty and thin strips of Prosciutto di Parma and fresh peppery arugula. If you're so inclined, drizzle a bit of good quality extra virgin olive oil or truffle oil for good measure. Easy and delicious! Tip: the pesto is easy to make and will keep in the fridge for a few days so double the batch to have some later. It's great tossed with pasta! In a blender, add arugula, garlic cloves, walnuts, olive oil, and salt and puree. Set aside. Roll out the pizza dough until it is about 12 inches across. Spread a heaping tablespoon or two of the pesto over the pizza dough. Distribute mozzarella and goat cheese over the pesto. Sprinkle with a pinch of salt. Bake pizza for 15-25 minutes or until cheese is melted and crust is golden and bubbling. Remove from oven and top with Prosciutto di Parma and remaining fresh arugula leaves.